In September 2012 Scott was suffering from side effects of lymphedema. He was 50-years-old, 520 pounds, and depressed. "I had chronic venous wounds on my legs and went back and forth to wound clinics for 2 years," Scott said. At his physician’s urging, he begrudgingly started physical therapy at the Baylor Institute for Rehabilitation in Dallas, Texas, where he met his physical therapist Stephanie Fournier, PT, DPT, WCS, CLT-LANA, and set a new course to change his life. "Right off the bat she said, 'I can help you with this, but it's going to be a 2-way street. You have responsibilities that you need to take care of, too,'"Scott remembered. "That was the first thing I liked about her." For 3 months, his wounds were treated with lymphatic massage therapy and compression wraps. Meanwhile, Scott held up his end of the bargain by attending physical therapy consistently twice a week, and explicitly following Stephanie's instructions for tending to his compression wraps. The venous wounds got Scott into physical therapy, but before he was through, Stephanie encouraged him to live a healthier lifestyle. Once again, Scott responded, losing 80 pounds. Gastric bypass surgery followed, and Scott eventually lost more than 300 pounds. As of 2015, Scott weighed just over 200 pounds and was competing in CrossFit Games, a huge change from where he was 3 years prior. "Physical therapy seems more like a partnership—working together toward a specific goal. You develop a rapport with a PT that you don't get with a physician. People think that physical therapy is just about the pain [of rehabilitation], but it's not. It's about getting better." 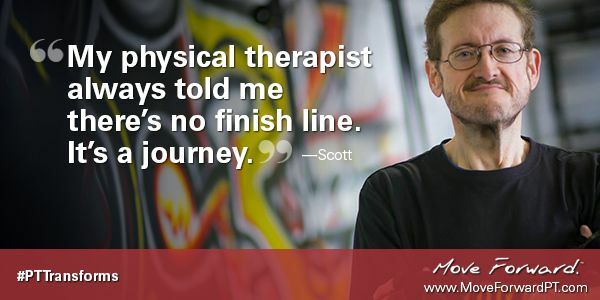 Listen to Scott's story on Move Forward Radio.